Did you know that crocodiles cry? They cry because their eyes are dry and tears refresh them. Crocodiles and alligators have been around lakes and rivers for 65 million years. 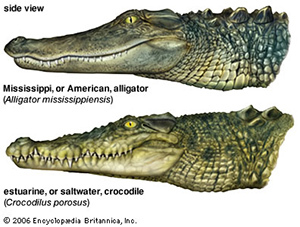 Although alligators and crocodiles may look alike, there is an easy way to tell them apart. Alligators have wider and shorter snouts, while crocodiles’ front teeth stick out over their top jaw. Crocodiles often lose teeth while hunting, but they can grow new ones. The longest crocodiles are nearly 20 feet long and live by the Nile River. Usually, though, they only grow to be around nine feet long. Crocodiles and alligators have scary reputations! But, there's still much to learn about them.